This week's lesson treats the third major source of Lindy Hop moves --- those done SIDE BY SIDE. To review, we have the WHIP based moves that are done facing each other, and the CHARLESTON moves that are done in tandem position. This group of moves, known as "Saint Louis Shag" add another dimension to Lindy Hop. The name "Saint Louis Shag" comes from the Imperial, a pre-Lindy dance that was quite popular in St. Louis and Kansas City. The dance takes its name from the Imperial Ballroom in Saint Louis. As with everything else, the Imperial got modified and adapted into Lindy during the late 1920s. The source was probably jazz musicians who regularly travelled from the Midwest to New York. The Imperial Ballroom still exists, and people still dance the Imperial in Saint Louis. From a theoretical point of view, the Saint Louis Shag moves are about half Charleston, but alas, they require that the Follower learn a Mirror variation of Charleston. We are going to start out with something called "Mirror Charleston" and then adapt it to Saint Louis Shag. The partners stand side by side, with the Lead on the left. As you stand side-by-side in this fashion, the team has "Outer Legs" (the Lead's Left, Follower's right) and "Inner Legs" (Lead's Right, Follower's Left). To do St. Louis Shag, it helps to think in terms of "Inner" and "Outer" legs rather than Left and Right. As we said, Side by Side moves are mirror symmetric, so the dance team will present an attractive picture by moving the "Inner" and "Outer" legs together. The leader places the right hand on the Follower's hip. The follower places the left hand on the Leader's shoulder blade. The leader holds the Follower's right hand with his left. Leads are passed by both the hands and a slight push on the hip. "The foot that isn't kicking is hopping"
Mirror Charleston is a very nice move in and of itself, and can be combined with the "Magic Step" to create the "Cross Kicks" that were taught in Lesson Five. "Rock Step, Kick, Down, kick, Hup!,Low!, Stomp!" The "Hup!" step is just like that. Bend the inner leg at the knee and bring the leg up high and hold briefly. The hold must be noticeable, but not too long. This is a jerky movement. The "Stamp" step is like squashing a bug. It should make a sound. You will get the timing just right if you actually visualize squashing a bug. Stomp the foot down, and then lift it just a tad to make sure you killed the bug. Saint Louis Shag takes a little bit of practice to get down correctly. The best song to practice to is "Rockin Robin" by Bobby Day. This has the same effect on a crowd in Saint Louis as "Sing, Sing, Sing" has on Lindy audiences. There are hundreds of Saint Louis Shag variations. We will show you a few but you will be doing well if you can master basic Saint Louis shag and the transition to cross kicks. Two Bars of Saint Louis Shag, etc. In all of the moves (St. Louis, Mirror Charleston, Cross Kicks), you have your weight down on both feet on beats 4 and 8, and it is here that you make your changes. On beat 5, the lead pulls forward on the hands and initiates the "Magic Step" The Inner Legs kick and kick as the outer legs pivot. The hand is carried through. The lead's other hand nudges the Follower's hip to indicate the reverse kick. The leader holds the hand steady and pulls the Follower's hip toward his side to indicate that the cross kicks are at an end. To switch to mirror Charleston: the lead does not do the highly emphatic "Hup" step. The follower will see this and catch on. 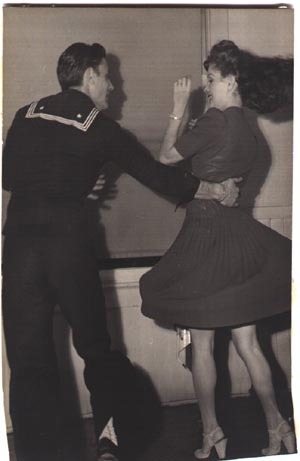 About our Photo: This is a picture of Maxie Dorf and his partner Colleen, taken in about 1942.